I'm using SSMS v17.1 and I just tried to uninstall SQL Prompt 8 but the uninstaller just hangs. 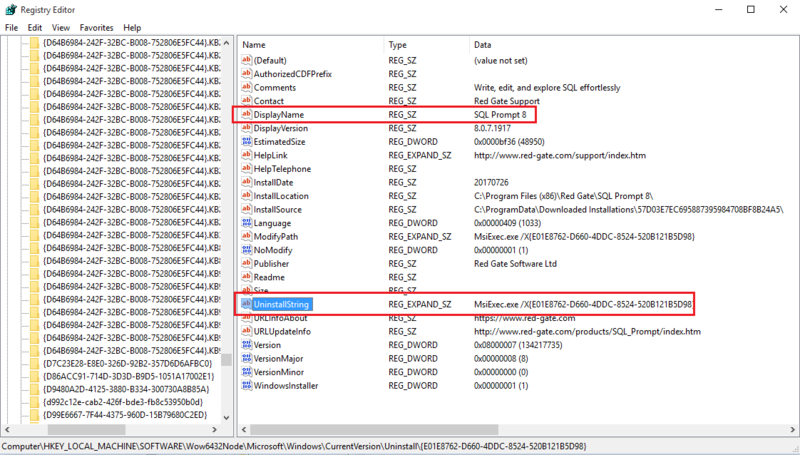 I was able to successfully uninstall SQL search and framework install entry, but not in the SQL Prompt 8. I ended up just deleting the entire RedGate folder in program files and it did the job, however this looks to be some type of bug. So sorry to hear you've both ran into this issue! @bml, can you please give this a try? @ZackS, if you are still running into issues as well and this hasn't helped, please let us know! So glad to hear that helped @bml! OS Version: 10.0.16299 N/A Build 16299. Any help you can provide would be great. thank you! This looks like a question that one of Support engineers will need to investigate for you. If you've a got support contract, please send us a ticket. Provide as much information as you can - screenshots of any errors, log files etc – so we can help you as fast as possible. If you're not covered by a Support contract at the moment, email our Sales team at [email protected], and they'll be able to help. know bits of sql and also few other things. So glad that helped, @percywilliamson!